The haveged project is an attempt to provide an easy-to-use, unpredictable random number generator based upon an adaptation of the HAVEGE algorithm. 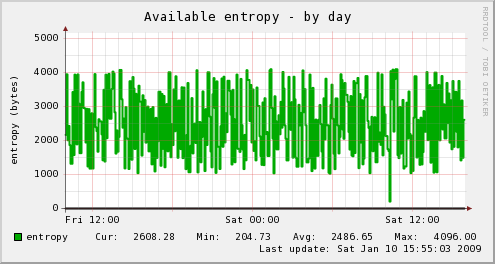 Haveged was created to remedy low-entropy conditions in the Linux random device that can occur under some workloads, especially on headless servers. Current development of haveged is directed towards improving overall reliablity and adaptability while minimizing the barriers to using haveged for other tasks. The original HAVEGE research dates back to 2003 and much of the original haveged documentation is now quite dated. Recent work on haveged has included an effort to provide more recent information on the project and its applications. The original research behind HAVEGE use was based upon studies of the behavior of processor caches from a hardware level. The 'Flutter' documents below attempt to provide a modern view of HAVEGE at software level through the use of a diagnostic build of haveged that captures the non deterministic inputs to haveged for analysis by external tools.